Whether you're in the market for a new toy or just like geekin' out over cool gear at your local guitar store, it's easy to reach that point when you just really can't tell what you're dealing with without dropping the $$$ and hoping for the best. Really learning these floorboards can take days and you have to be able to break the thing in for all the different venues and settings in which YOU play. Most people can't or won't buy 3 different boards or spend the night at their favorite music store, so this shootout is an attempt to help my fellow guitarists out a bit. As you read on, you'll see that each unit has their little goodies that make them unique and depending on how you play and use your gear, you may find one that clicks with you, or you may just find you have to go play one yourself... or both! I'm not attempting to decide here which one "sounds the best" or "is the best" (which is why there are no audio samples included). 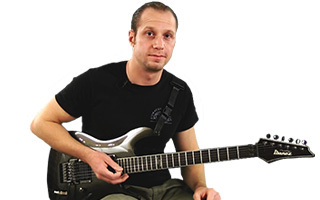 Sound and feel preference is very subjective and can only be discovered on a a level between you and your guitar. I am also not giving out a tutorial or owners manual substitute. The purpose of this article is to give you a beyond basic overview as a starting point to aid you in your quest for your sound. Read on and enjoy! One of the primary testings grounds... my home studio. The first box I got my cords plugged in to was the TC Electronic Nova System. This is because I have gig'd regularly with it for some time. Consequently, reviewing this unit did not consume nearly as much of my time as the other two have over the past week. The Nova System might be looked at as being in a slightly different product line than the other two guys in this comparison, but most people I talk to about floorboards have no idea that it IS different. The Nova System is not a modeling box. In other words, it doesn't attempt, as the others do, to emulate other popular amps. It is its own sound and you can either take it or leave it. Aside from this key difference, it can function in many of the same ways as its friends. You can still get a massive variety of tones and effects but it isn't making any claims to sound like anything else. The Nova System is the only one of the 3 units to sport an Analog drive circuit. This means that its distortion works just like a basic distortion pedal in front of an amp, and it works well that way too. I ran this box successfully in three different setups. The first being with my guitar plugged into its "drive input" and then directly in to my recording software. There was no amp, and no room for one. There is only 1 set of analog outs on this guy and they must either be configured with cabinet emulation ON or OFF. This means that you can only go to one source at a time. Anyway... I digress. While recording in my software of choice, I was able to get most tones out of it that I wanted, except that broken up Fender amp type sound (but remember, it is supposed to have a sound all it's own). It does very well with high gain and low gain stuff, and feels good while you're playing too -- you can really dig in and get some responsiveness out of the sound. It has all standard effects such as many varieties of reverbs, delays, modulation, compression, pitch shifting etc... and they all suited me just fine. You can also save tons of presets in different banks, just like most boxes these days. The tones I created for recording translated perfectly to a live setup when running directly to the PA out of the box. There is only 1 set of analog outs on this guy and they must either be configured with cabinet emulation ON or OFF. This means that you can only go to one source at a time. Anyway... I digress. While recording in my software of choice, I was able to get most tones out of it that I wanted, except that broken up Fender amp type sound (but remember, it is supposed to have a sound all its' own) It does very well with high gain and low gain stuff, and feels good while you're playing too -- you can really dig in and get some responsiveness out of the sound. It has all standard effects such as many varieties of reverbs, delays, modulation, compression, pitch shifting etc... and they all suited me just fine. You can also save tons of presets in different banks, just like most boxes these days. The tones I created for recording translated perfectly to a live setup when running directly to the PA out of the box. The second way I ran this box was to put it in front of one of my favorite amp heads, a Vox AC-100. I'm still going in to the â€œdrive inputâ€ at this point which means I'm using the Nova System's analog drive channel. I turned the speaker emulator off, ran the Vox amp clean and had some fun! The disadvantage to running the Nova System this way is that you are stuck using only the Nova System's drive and distortion sounds if you want to use any mod, delay or verb effects. This is because you want to run drive distortions before those effects iny our signal chain most of the time. In other words, I can't use my Vox drive channel in this setup. This leads me to the third and final way I ran the Nova system and one of the main features that sets it apart from the other two boards. Here's the setup: Sending out the Vox amp's effects send in to the Nova System's "line input" -- then out the left or mono jack of the Nova System to the Vox's effects return. There some tweaks you have to make in the Nova System's preferences/setup/ utility menu, but once you have made sure speaker emulation is off, and the "line input" rather than the "drive input" is enabled, you're good to go! When running in this mode, the Nova System becomes one of the best guitar multi-effect units out there, and completely bypasses any coloration from it's drive channel. You can now use your amp's distortion channel freely, or put any other distortion or drive pedals in front of your amp for huge variety of tone! 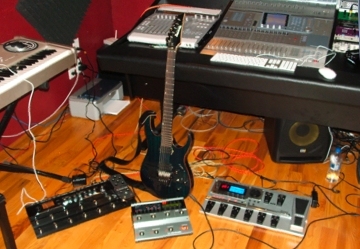 The other boards do similar setups to this, but neither of them allow you get JUST YOUR AMP SOUND plus great effects. So if you're one of those guys that is totally sick of having 400 pedals on 9volt batteries and cables everywhere, but still love the sound of your amp and want killer, transparent effects, this unit is probably the one you want to take home. Plus you get the two other setups to use in different gig or recording situations. Navigation for creating your tones is pretty easy. It has effect buttons on the front that when pressed let you choose the type of delay (tape, ping pong etc..) or chorus, or other mod effect etc... You simply press one of these buttons repeatedly until you find the flavor you want, and then use the screen and assignable knobs to fine tune the effect, drive setting or level. Navigation when switching patches on the fly live is where this box could improve. Because your stomp box (effect on/off) buttons double as your patch number options on a given bank, you have to press and hold with your foot to changes patches or banks. This was a huge pain for me live because I had to focus too much on what my feet were doing. TC Electronic has a box called the "G-Switch" you can purchase to help you out a bit, but it is an extra $40-$50 and you still have to do some press and hold. The other thing that bums me out about this unit is that there is no included expression pedal. Yeah, you can go buy one and it does all the same stuff that the other boxes do, but you still have to go purchase something else. All in all, if the Nova System integrates into your existing system, or you see yourself wanting to customize your setup with box that plays nice with other gear, this is the one! Press the "EZ" button and you get a screen asking you which types of pickups you are using -- humbucking or single coil. Use the assignable knobs to choose. On this same screen, you are asked to choose where your GT-10's output will be going. Will it go to the front of a combo amp, an amp head, in the effects return of an amp or directly into a mixer/line setup? Then on the arrow pad, press the "forward" arrow to go to the next screen. Here you will choose your base tone, and you have many to choose from (blues, 80's rock, metal etc...)! The Boss automatically picks an amp model, genre common effects and settings, EQs, drive, and compression settings -- all of which can be changed or customized later. You are then asked to choose a variation based on this basic configuration. Most of these variations include different gain and effect settings based on the genre you chose earlier. For example, you might have a clean tremolo variety of a 80s rock base model/sound. The next two screens were weird at first, but quickly became my friends. They consist of graphs. The first graph deals with "soft to hard" (distortion/gain level) and "solo to backing" (mid scoop/boost, presence adjustment). The 2nd graph lets you choose between "wet or dry" and "short or long" effects settings, which in my experience, almost always was dealing with delays. At this point, you can save your new preset. When I was reading about this way of building tone, I scoffed and made fun of it, but once I got a chance to use it, I really understood why it is a good thing to have on a modeling floorboard. Stock presets never sound good to me. I like to go in and at least try to get in the ball park of a sound I like, and I want to be able to do it quickly. Sure, there will be a lot more tweaking, but the basic sound was there in under a minute each time I was trying to squeeze out a different tone. The GT-10 is run best directly into a PA or recording setup. You can run it into an amp, but you are then not experiencing that amp for what it is (its unique qualities), you are using your amp to amplify a modeled sound which is not a bad thing, just kind of redundant in my opinion. If you want to use an amp, run it into an effects return bypassing the amps "preamp" section. This way, your GT-10 is the preamp, and your combo amp or head is just functioning as a power amp. This worked well for me and the Vox AC-100. Because there is only one set of analog outs, you have to configure the EZ setup so that the output is optimized for its destination. This can be saved with the preset. The face layout on this board is just great! You can see everything that is going on, and you can access any effect or part of the chain with the touch of a button. Your included effect pedal functions as a volume pedal most of the time until you stomp on the toe and it becomes something else (usually a wah). I like all the bright buttons and contrast between the brushed metal and the black and white text. It makes it really easy to read from a distance, such as standing up while bright lights shining on you. The GT-10 has two other features that really stood out to me and set it apart from the others. It has a loop station-like feature built in. It lasts up to 40 seconds and is great in a solo performance setting. Basically, you can record yourself, and then play over yourself a number of times - all on the fly. You can also use this box as a guitar recording interface via standard USB. (see next page for a pic) I ran it as the interface for Apple's Logic Pro and it worked on the first try just plugging it in and setting the audio preference to GT-10 inside Logic's audio menu. Neither of the other boxes were capable if this recording integration. This makes the GT-10 ideal for making backing tracks, adding guitar to an already produced track, or playing things back out of your favorite recording software. I had good luck recording bass and line-in acoustic guitar as well. It doesn't take the place of a full-blown recording interface with mic preamps and multiple ins and outs, but its darn handy and works like a charm. To sum this one up... If you like things simple but versatile, you're tough on your gear, and you need a simple, great sounding all-in-one unit, this one will make you happy. You'll also walk away with the added bonus of having a built in loop station and basic recording interface! 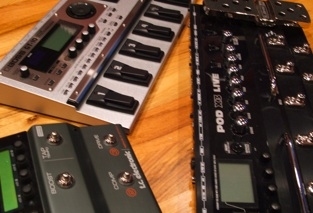 During the other tests, I was always anxious to get to the Line 6 POD X3 Live because it seems to get the most press. I see them everywhere and having never really used one, I was quite curious. Line 6 certainly has the greatest variety of modeling products out there and also has a huge, easy to navigate website dedicated to improving the experience of owning their gear. One of the really great additions to most any Line 6 product is the free "Line 6 Monkey Software" download that allows you to back up all of your settings to a computer (either Mac or PC). This is great if you want multiple board setups or you just want to make sure your settings don't get permanently screwed up by someone messing with your gear. If you've used Line 6 gear before, there will be no surprises. The X3 Live has the sturdy amp-like knobs and controls right on the face of the board and has the smoothest feeling expression pedal. The face layout is easy to understand and looks great and it has convenient handles that double as guard rails to keep heavy gig-related things from falling on it and causing damage. The knob range really stood out on this floorboard. It seems to have more spread in delay times, distortion/saturation, overall effect wetness and has a great setup for being really tweaky with your sounds. It was much harder to find my basic tones than on the GT-10 or the Nova System but was easier to go deep into cool layered textures and less 'typical guitar' sounds. The basic clean, crunch and drive tones are in there, but I had to do some searchin' and a considerable amount of editing before I was happy with what was coming out of it. The X3 Live really shines when it comes to its I/O. It has a dual input and tone mode so you can have one guitar with two unique sounds on it (completely independent signal paths) or you can setup one path for guitar, and another one for vocals, bass, or a second guitar. I ran vocals and guitar through it simultaneously and it worked great -- a real plus for small or solo gigs where there is minimal to no PA. It was also cool to set it up and have a huge stereo sound coming from one guitar through two different sounding amp models with different effects. Neither of the other boxes got even close when it came to this feature. The outputs on the X3 Live are equally awesome. You can send tones 1&2 out to two mono or two stereo record/direct feeds. You can send out to multiple amps too. For example, you could use the dual tone feature with one guitar and feed one tone to one amp, and then the other tone to a different amp. You could even set it up so that one amp is running dry, and the other amp is simply handling all your effects. The coolest feature for me was being able to send direct to a mixer stereo with speaker emulation on AND send to the return of the Vox amp and 2x12 cabinet with speaker emulation off. This way I had the stage sound I wanted, but also had a killer direct sound for the record feed. The X3 Live was the clear leader in flexible and creative routing setups. So... you can't go wrong with any of these floorboards. As you've seen, each one has their unique take and feature set. They are all priced right around $500 so take your pick. I hope you've enjoyed this first gear shootout.